Since every business differs in terms of size, there is no one-size-fits-all when it comes to CRM. Thus, varying corporate sizes require unique CRM software that best addresses requirements. We’ll be taking a look at ideal CRM software options for the following categories: businesses in general, very small businesses and ones that are free. Salesforce has long been considered one of the top-tier CRM solutions, mainly due to its cloud-based nature coupled with full-featured capabilities that cater to businesses of every size. Typically, Salesforce is synonymous with larger enterprises, but that doesn’t mean small- and medium-sized businesses are denied the same perks. Enter Salesforce’s small business edition: with it, SMBs can utilize the robust set of CRM tools at an affordable rate. Salesforce Small Business Solutions offer packages that are tailor-made for small businesses. With it you’ll be able to fully utilize all that Salesforce has to offer. In order for your company to really thrive, your CRM should be equipped with features such as lead generation, contact and opportunity management, sales forecasting, workflow automation as well as collaborative tools — all of which can be found in Salesforce. Also, the software is cloud-based, meaning that you can access data and files anywhere at anytime via mobile devices. Underneath its simple and navigable facade lies a CRM software that is abundant with capabilities, all of which fit the bill for microbusinesses. Aside from the fact that it has the vital components small businesses really look for in CRM software, it’s also highly scalable to accommodate the growth of your company. Furthermore, Insightly is currently one of the more affordable CRM solutions on the market; there’s even a free version if you wish to test the waters. There are also paid plans available at a fraction of the price when compared with other CRM software solutions. Even with the free version or paid plans that start at $12, Insightly doesn’t compromise utility with affordability. It comes equipped with all the vital CRM capabilities any microbusiness would need. This includes detailed sales reports, opportunity, contact and project management as well. It’s also scalable to meet the needs of your business as it grows. To top it all off, it’s a cloud-based CRM software allowing you to access data anywhere at anytime via Internet-enabled mobile devices. 360-view – all the vital information is stored and displayed, allowing you to make the best business decisions. This includes contacts, sale cycles, pipelines, and discover trends. It also helps you identify opportunities. Automation – spend less time dealing with mundane tasks by automating tasks such as lead generation, contact management, calendars and even call logs. Collaboration – Zoho CRM doubles as a social media platform integrating with Twitter and Facebook to link contacts to their social media accounts. This allows you to see their updates as well as the interactions you’ve had on social media right from your dashboard. Analytics – you can track sales as well as measure both business and employee performance via a range of reporting capabilities. Security – with Zoho CRM, you are given full control over who can do what with the software. Besides creating individual user profiles, you can assign roles and even restrict access. Unlike farms, the main component to a company’s growth isn’t fertilizer and sunshine. 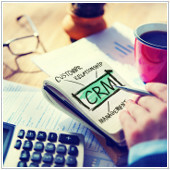 Instead, it’s competent CRM software that allows your business to reach its full potential. If you have any questions on customer relationship management software, feel free to get in touch with us. We’re more than happy to not only provide answers but also be part of your success.